A whirlwind of a day! A gathering of new friends! An explosion of senses! Soon after we decided to come back to Penang for a few months we discovered that another family was headed this way as well. Then another, and another, and well, you get the picture. The nice thing about this lifestyle we lead is that we typically can pick and choose dates for excursions, last minute even. So everyone worked together to pick the same week! When we realized we would all be here together of course one of the first things we needed to do was to start picking fun activities that would suit all the children and adults. In total there were 16 adults and 21 children that span from infants to teenagers. Finding fun things to do is easy but exciting outings for that many people in that many age groups I thought may be a challenge. When Travel with bender discovered that the Hard Rock hotel throws its monthly foam party during the same week everyone would be here (always the first Saturday of the month) we knew we had to check it out. They separate these parties; 1 for children where the foam isn't quite a high, and 1 for he adults in the evening. The price was not bad at kids 20RM and adults 30RM (roughly $10 US). Towels are provided. A word of warning though, the drinks are astronomically priced! 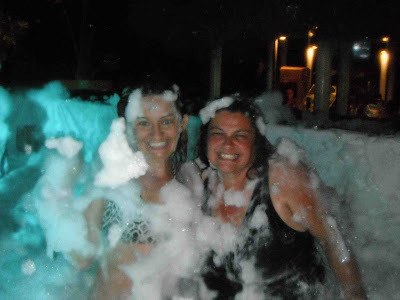 For those of you who have already been wondering, "what on Earth IS a foam party?" Picture a pool filled with soapy foam and hundreds of your closest friends. Then picture alcohol, grabby hands under the disguise of said foam, and an extremely slippery....well just about everything, and loud music on top of all that. The kid's party started at 5pm, but along with entrance to the party comes entrance to the great pools and slides that the Hard Rock provides, so we all went down at 4pm to enjoy some extra swim time. We were a bit surprised that the foam pit was rather small and also right on the beach. My mind immediately started to wander to the ecological implications of all that chemical laden soap just washing away into the ocean. The older kids had a blast at the party (the pit was plenty big), but for smaller children it just didn't seem to be very fun. They are too small so the soap got in their eyes pretty much right away. Thankfully they have a wonderful hose off station but the under 5's in our group didn't spend a lot of time in there. The older kids enjoyed for about 1 hour but ended up in the pool for most of the time. Luckily the under 4's got in for free anyway. A quick turn around with the kids, a shower and back into our suits we went. The adults slowly ambled our way back to the Hard Rock Hotel Penang for our portion of the party. As we entered the facility we noticed quite a party going on, except it was NOT completely for the foam party...it was a wedding! A wedding directly next to the Foam pit? Maybe they needed the free DJ? There wasn't a huge crowd, which we actually all enjoyed, but it was a wonderful and silly time. We splashed in it, wrestled in it, danced, and had some wonderful, albeit very costly, margaritas. For a closing we ran past the rinse off station and slid down some of the slides that were not closed. It was so refreshing! It is discouraged though to go down with soap still on, whoops! Tips: Do not inhale the foam, do not open eyes in said foam, be sure your camera is waterproof, and do not under any circumstances think that a pool float will actually FLOAT on top of the foam. 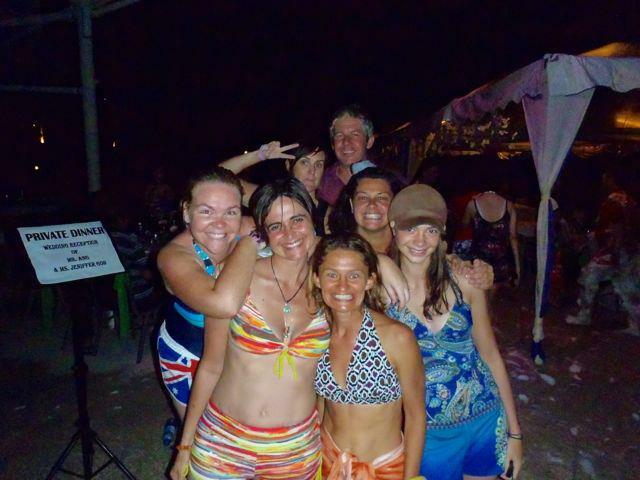 Have you been to a foam party? Where? What did you think? Please follow our adventures on Facebook! I haven’t been to a foam party yet and for the surprise this is the first time I’ve heard about it. Looking at the pictures I can say that you guys had a great time and I’ll try to get into one and gain the same experience.